We take the Nikon AF-S NIKKOR 400mm f/2.8E FL ED VR super telephoto lens out each weekend to do test photographs. This month we are studying Plumeria tree habitat. This tree is also known as frangipani. 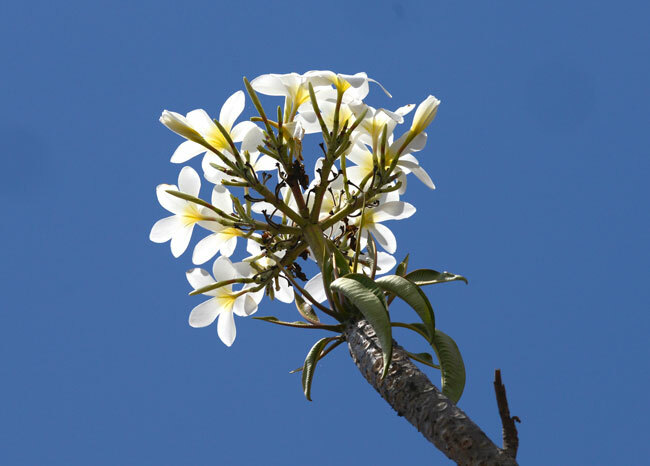 Although it grows in Hawaii and Singapore and around the world, the Plumeria is native to Mexico and Guatemala. Since many of the trees are far away, it helps to have a telephoto lens. Previously we had only a 200mm lens. But we are finding that the 400mm lens is essential for tree and flower photography. Here is a view of a distant set of hills with Plumeria trees with a 60mm lens. We will show view with 400mm lens in next update. Nicholas at work out in the hot desert-like area of Guatemala. Although there is a seasonal rain forest less than 100 km north, we are working in the “rain shadow” desert-like area this month. Here is a sample photograph of the flowers of a Plumeria tree, with Nikon AF-S NIKKOR 400mm f/2.8E FL ED VR super telephoto lens. The tree is up on a hill immediately above me (so not on a far-away hill). We selected this newer Nikon lens over cheaper earlier versions because the new model was top-rated. Now that we have it out in the real world we also give it a top rating. This is a real customer review since we bought this lens anonymously (no one knew we were a long-time reviewer of camera equipment). Since we have been giving courses in digital photography for many years, we will have tips and a guide for using this lens in the coming months. The Nikon AF-S NIKKOR 400mm f/2.8E FL ED VR prime telephoto lens is only when you want quality and you don’t worry about the price or cost. When I was with my German girlfriend Andrea (nine pleasant years), I was very careful not to spend big-bucks on any item of equipment. She would ask me “how often have your used this piece of equipment? 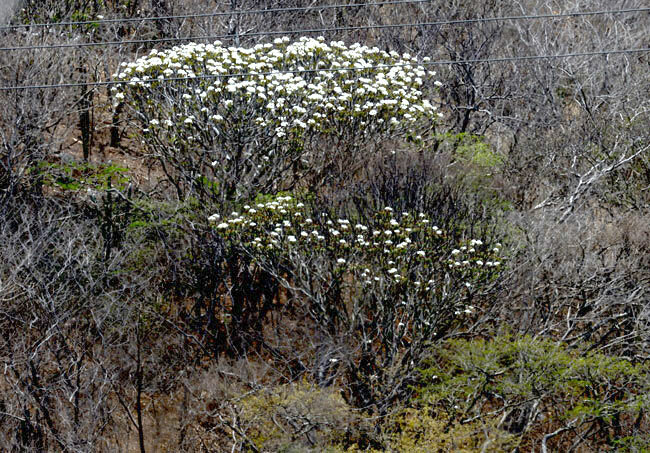 !” Now that I am single, I prefer to have quality equipment and ignore the cost (not that I am floating in money, but if you are driving thousands of miles to find a rare Neotropical tree in bloom only one week a year, why waste this moment by using a cheap lens?). Although all our initial test images are flowers high in trees, or trees far into the distant mountains, we will also be testing this Nikon AF-S NIKKOR 400mm f/2.8E FL ED VR telephoto lens for bird photography. Most of our bird photography will be water birds of the Pacific Ocean coast of Guatemala, rivers and lakes of El Peten, and the Canal de Chiquimulilla, Monterrico, parallel to the Pacific Ocean coast. These are the birds which appear in Classic Maya art, paintings, murals, and decoration of Maya vases. My PhD dissertation included a study of the iconography of water birds (available from ADEVA, Graz, Austria; we have a few copies still available for individuals or corporations who donate to support our research in Guatemala). FLAAR is dedicated to the photography of landscapes, eco-systems, nature, flora, and fauna. We do not do portrait photography, sports, or action. But this Nikon AF-S NIKKOR 400mm f/2.8E FL ED VR telephoto lens would be great for sports or action, though frankly a zoom might give advantages (depending how far away you are from the teams playing each other). Plus the weight makes this not a lens to hand-hold the entire length of a soccer or football game, or baseball game either. We use it on a Wimberley gimbal (their top of the line model). If a Tamron, Tokina, or Sigma lens were provided for us to test, I would be willing to give each brand a chance. But our past experience with Tamron and Sigma are not conducive to being impressed. My first camera at age 16 was a Leica (in 1962). I had a Hasselblad by age 20. Then went to 4x5” by 1990’s and then to 8x10” (even for field trips in remote areas of Mexico). Sorry, it would be tough to convince me to use a Tokina. One of our student assistants had a Sigma telephoto lens and he said it was too slow. My Austrian girlfriend had a perhaps 100mm or so Tamron lens and the results were so fuzzy it was embarrassing. Circa 1996 I began to use digital cameras and never went back to a Leica. Nikon and Canon are much better with digital operating systems (though Capture One of Phase One medium format digital is even better). The only lens other than Nikon or Canon that I would be tempted to test would be a Sony lens on a Sony Alpha camera. But since the Nikon AF-S NIKKOR 400mm f/2.8E FL ED VR telephoto lens is with us day and night, and since the test images are awesome, it is tough to take the time to go through evaluating another lens. We do not take kickbacks from resellers, so receive zero income from evaluating lenses or DSLR cameras. The automatic focus is quick (immediate). No slow focus. Manual focusing is easy, and very sharp also (even though I have astigmatisms, cataracts, and 70-year old eyes). Photos are sharp, crisp, and fully professional. Don’t look at the price; if you want the best lens, simply buy it and ignore the price. Don’t think about the weight: just put it on a Wimberley gimbal tripod head and harvest handsome photographs. That said (weight), I am not sure how long you could hand hold it without a tripod, but this we will test while doing bird photography, since this we do all bird photography from a boat not much bigger than a dugout canoe. Not always easy (or safe) to attempt to stand up with a tripod in such a small boat (that moves from side to side suddenly when it hits the wake of other larger boats in the rivers or lakes). I am fully content with this lens, though it is definitely an entirely different kind of piece of equipment. When on a field trip, setting it up, and taking it down, takes patience and effort. But the Mayan student intern assistants learned how to handle the set up quickly. 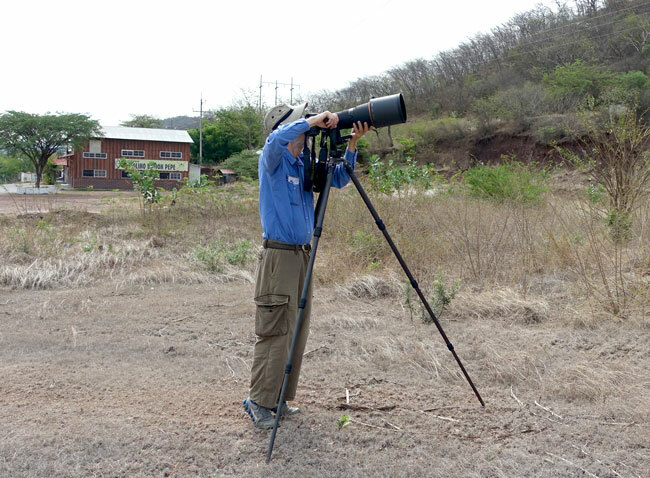 Prime telephoto lenses are made for sports, action, and wildlife (especially birds, and animals while on safari). In Guatemala the Neotropical seasonal rain forests are so thick there is no way to photograph any jaguar or puma. Even in the open deserts, the only animals are the local variant of the Gila Monster and wild native rabbits. The rabbits are unlikely to stay still long enough for you to move your lens. But for birds, yes, even in the thick jungle, especially if you are up on a cliff or up on a Maya temple-pyramid (where the birds are at your own level). First posted June 11, 2015.